← Driving the American way: The best way to travel? It is often a moment of great dread, sometimes likened to that split second before you pull the trigger in a game of Russian Roulette (performed with a Nerf Gun for Health and Safety reasons). The fact is this: Even though I believe that every car has at least one redeeming feature, the truth is, there are a lot of cars out there you really do not want to drive. A lot of them are known to be so boring in fact, that they unofficially account for 90% of accidents linked with sleeping behind the wheel. Some cars are designed to be just a car. And rental companies love them. Therefore, when you choose to rent a car, you never really know what you are going to get but nine times out of ten, it is going to be just a car, nothing special. Actually, scratch that, it is going to be a bad car, the type you drive, and just forget. So there I was, in the rental car office, being told I had the choice between two cars: A white one and a black one. At least that gave me more options than the early Ford Model T buyers I guess. The white car was a Dodge Avenger, a car with a superb name, but known for being all plastic inside, and the black car was a Chevrolet Cruze, a car I secretly had wanted to drive for some time. Needless to say, I chose the Chevrolet. The thing is, even though Chevrolet like to toss the Volt around as the sign they have changed, the real story is different. There is one car credited for turning GM around. It is a car not Made in America actually, but is also often praised in being a decent vehicle. You see, the Cruze is a genuine global car. It may have been designed mostly in South Korea, by the old Daewoo division of General Motors, but it was meant to fit anywhere in the world, something Chevrolets of the past have had trouble doing. That is why I often see the Cruze in France or Canada and when I was in India, they were all over the place! Ford like to say the Focus is their “one car for one world”, but for an American company, GM beat them to it. As a global car, the Cruze was therefore intriguing to me. Was it a compromise, like the Focus? Would it handle well, being American? The questions were there, now I needed the answers. From the outside, the Cruze looks pretty decent. Yes it is not a good looking car, but it is not bad either. It is a car that could fit in central New York, as much as rural Afghanistan. Yes, the front grille may be big, and the rear particularly bland, but overall, it was okay. On a personal note though, I found the front to be sharp and edgy, which contrasted too much with the more curved rear. It looks a bit as if two separate designers drew the car. Once inside, I was pleasantly surprised. The seats were comfortable, and the materials were pretty good. Yes it was still hard plastic, but it felt less rough than Chevrolets of old. The front dashboard keeps the Transformers-y theme of new Chevrolets and can seem too clustered for some. However, when driving I found that the buttons were placed logically, all in easy reach. The front seats were good, but offered little bolstering, sort of annoying when cornering. The rear seats were spacious enough to fit three people comfortably. My only big gripes with the interior were the weird mesh material on the dashboard and the centre armrest. Because of American love for cupholders, the centre armrest is half cupholder, which means it is hard to rest your arm on it. A detail yes, but you do notice it on long trips. Regarding long trips by the way, they are great in the little Cruze. The stereo is nice and powerful, the equipment is enough to keep you entertained (such as the cruise control), and the steering wheel feels great. Then again, it should be good; it is the same one from the Camaro, which I also drove. On the highway, cabin noise is limited, which is good on long trips. 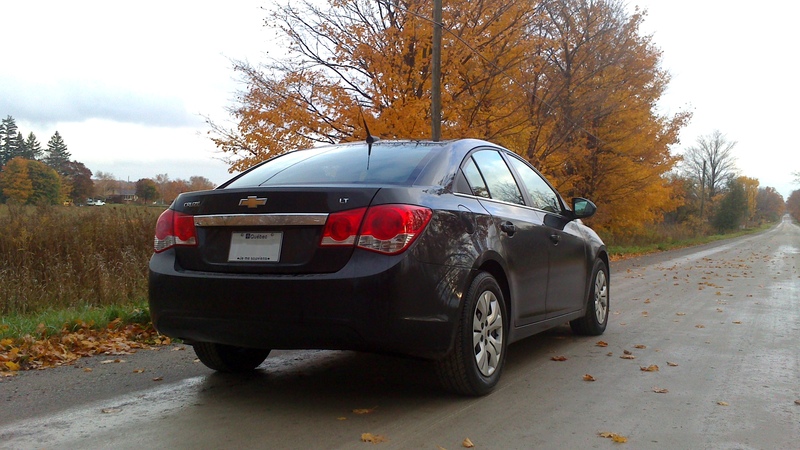 Once you start pushing the Cruze a bit more though, both the good and the bad reveal themselves to you. On the one side, my greatest astonishment was how the Cruze handled. On small winding roads it changed direction with little drama and handled nicely. Okay, it was not amazing, mostly due to the fact that this is a heavy car, 1.5 tons in fact, but compared to the American cars we were used to, it’s great! In corners it may have a lot of body roll, but that’s mostly due to the fact the car is designed for a comfort more than sporty use. The suspension does its job well on bad roads and filters out bumps very nicely. Steering is easy to use around town, but just feels very vague when driving enthusiastically. It lacked precision is what I am trying to say and I would attribute that to the electric steering my car had. 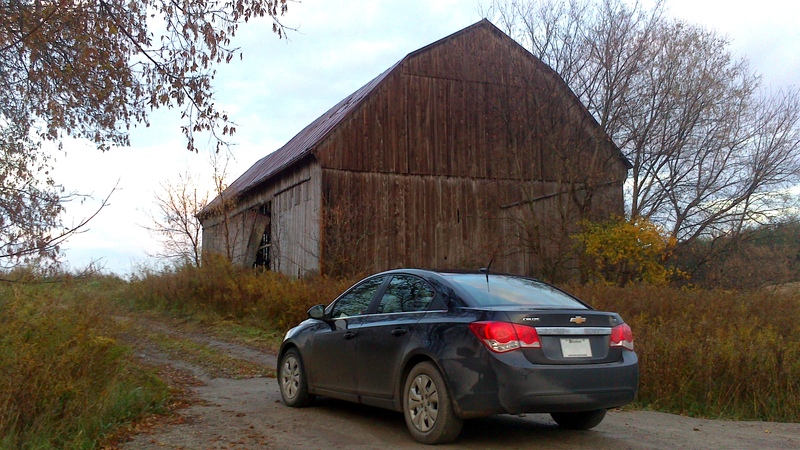 All in all, the Cruze is a great distance cruiser, perfect for American roads. However, the grass was not all green on this side. The first thing I hated was the automatic gearbox. Now, I am not a fan of automatics, but this one was particularly bad. It was slow to react, shifted whenever it wanted, and was very clunky and jerky at slow speeds. Put on the manual mode and it would get a little better, but still very slow to change. The gearbox revealed another problem with the car. Mash your foot down, and suddenly this screechy wail of a sound resonates in the cabin. The engine, a 1.4l turbocharged 4 cylinder developing 140bhp, is quiet below 3,500rpm, but above, the sound it produces can be likened to the shriek of a Lord of the Rings’ Nazgul, ie not good and deafening. The other problem with this engine is the lag. Below 2,500rpm, put your foot down and nothing happens for a good five seconds. I thought modern turbos did away with that issue; turns out not quite. 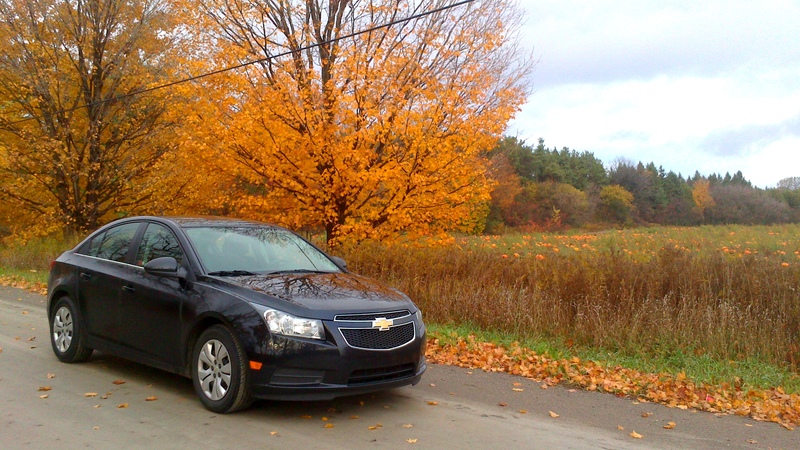 All things considered, the Cruze is a nice little car. It is comfortable enough, handles well enough and looks just enough. The only problems are the engine, gearbox and limited handling. Seems like all the car needs is decent suspension, a manual transmission and a V6 to please me. But then again, if you want a car to go from A to B in comfort, and do not really care about cars, then it is perfect for you. Which is why GM are selling Cruzes by the millions and it is the car that literally saved them. It is also why the Cruze is the perfect rental car. 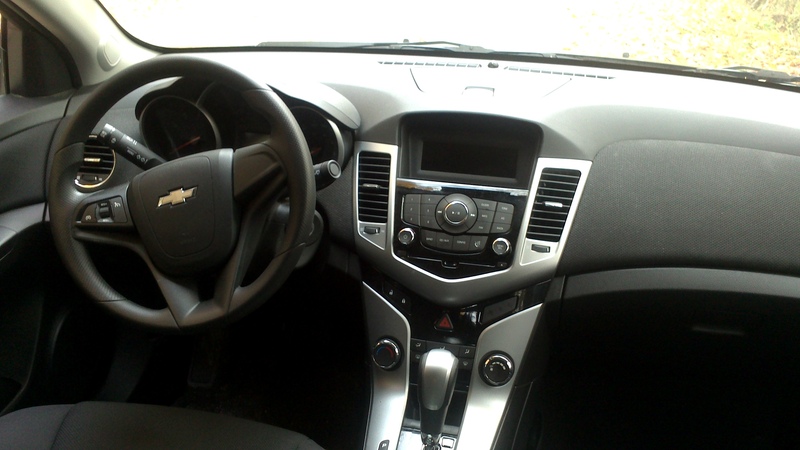 This entry was posted in Car reviews and tagged chevrolet, cruze, daewoo, focus, Ford, global, nazgul, rental, review. Bookmark the permalink.